Steel Arch Buildings' S Models are used all over the world as warehouses, manufacturing facilities, equipment storage, commercial offices, and retail outlets. Our customers include Fortune 500 companies, every branch of the United States Armed Forces, and some of the largest shipyards and mining companies on earth. Engineered to withstand the harshest environments on earth, our buildings deliver the strongest, most flexible, protective shelters money can buy and are Hurricane Rated and Snow Load approved! 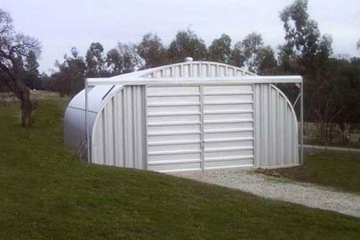 Steel Arch Buildings' steel building kits are perfect for all of your building needs. Popular uses for our buildings are warehouses, retail stores, garages, carports, workshops, livestock, RVs, sheds, barns, sports arenas, aircraft hangers, jet skis, boats, grain storage and much more. Visit our S Model Buildings Gallery for more images of our S model buildings. Call U.S. Buildings now toll-free at 800-222-6335 to speak with one of our customer service specialists. Be sure to ask about our monthly money saving building specials that could save you up to 60% off your steel structure. You give us the specifics of your building projects and we’ll provide you with great options, a competitive price and a building that you’ll be proud to show off. Call us now!